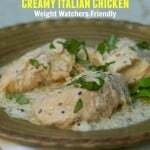 I made this 3-ingredient slow cooker creamy Italian chicken recently. It couldn’t have been easier or more delicious. I just cooked boneless skinless chicken breasts in a little light Italian dressing until they were tender, and then added some reduced-fat cream cheese until it was melty and creamy. It’s a lighter, healthier, more Weight Watchers friendly variation of a popular crock pot recipe called Cream Cheese Chicken, which usually involves a can of cream-of-something soup, a package of dry Italian salad dressing mix, and an entire block or two of cream cheese and sounds delicious, but which I have yet to try. This is a super easy recipe that’s perfect for a busy day. Just 3 ingredients and about 5-minutes of hands-on cooking and you’ve got dinner. Well, almost. You can serve it as is, or over rice or noodles to catch all the yummy sauce. Or over zucchini noodles or cauliflower rice if you are watching your carbs. Add a green vegetable and/or simple side salad and you’ve got a healthy balanced Weight Watchers family-friendly meal. For best results use a light Italian dressing with lots of flavor. Add crushed red pepper flakes for a hit of spice. We really really liked this Easy Slow Cooker Creamy Italian Chicken. According to my calculations each serving has 177 calories and *4 Weight Watchers PointsPlus, *5 Weight Watchers SmartPoints, *3 WW Freestyle SmartPoints. 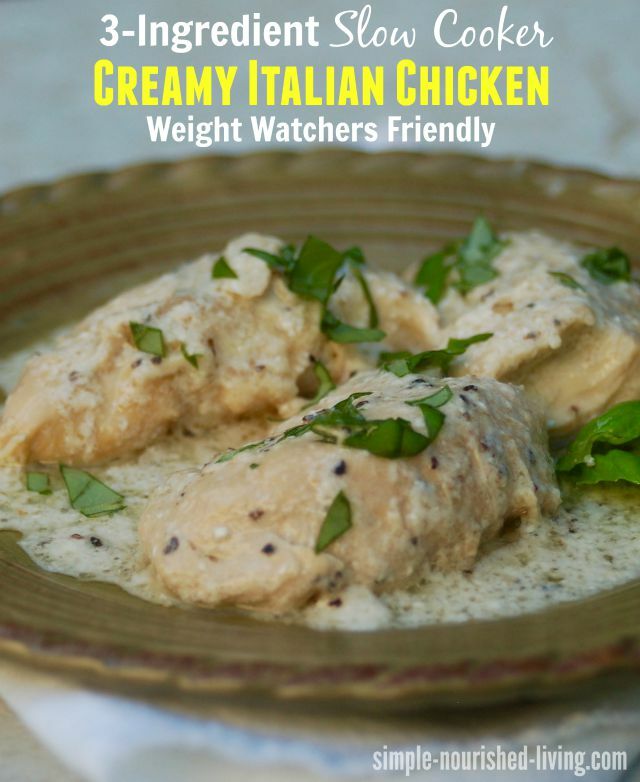 If you’ve made this Creamy Italian Crock Pot Chicken, please give the recipe a star rating below and leave a comment letting me know how you liked it. Boneless skinless chicken breasts cooked in the crock pot with a little light Italian dressing until tender, and then finished with some reduced-fat cream cheese, turns out tender and flavorful! Ideal slow cooker size: 1-1/2- to 2-1/2-Quart. Season the chicken well with salt and pepper and Pour over the dressing. Cover and cook on LOW for 4 to 6 hours, or until the chicken breasts are tender. Cut the cream cheese into cubes. Turn the slow cooker to HIGH. Add the cream cheese and stir until melted and well blended. Serve over rice or pasta or with mashed potatoes, and a veggie and/or salad for a complete meal. Have you seen this Cuisinart 3.5-Quart Programmable Slow Cooker (affiliate link)? I and my wife are trying to eat meals that have no more than 5 – 6 grams of fat. Plan on trying this one soon. Fits right into our plans. We like to use our crock pot often, especially since we both work. Thanks for the suggestion. The recipe sounds really good, but the finished dish is really soupy. Is it supposed to be? This was so easy and so very good. I made it with 1.25 lbs of chicken tenders in the crockpot and Olive Garden light Italian dressing. My husband and I loved it!! I’ll definitely share this with my sister and my daughters. Hi Martha! We have only one crockpot (& have room for only one), so we can’t use a 6 qt for this? This recipe is now on the regular rotation. It was everything I hoped it would be and more. For years I’ve baked chicken breasts that were marinated in Italian salad dressing and this recipe brought it to another level. I’ve been eating very low carb and the pasta was a nice treat. Thank you again for a wonderful recipe.